Choosing the right toilet paper is tough. So is Charmin Ultra Strong. Its texture helps your family get clean and it's 50% stronger when wet. Getting a dependable clean goes for the little ones, too, which means one less thing for you to worry about. A bath tissue that's durable and dependable? Maybe the choice isn't so tough after all. Package contains 16 Triple Rolls = 48 Single Rolls. Good product. I prefer this to the softer Charmin version. This one doesn't shred. The product is not the thicker style so to be honest I felt the price was quite high. I was expecting larger rolls for the price. Only bought as was home and unable to get out due to health. I've tried other brands but always come back to this hard to find tp. Glad it's sold by Well as I shop here a lot. Soft, but also strong. It might be a bit pricey, but it's worth it, in my view....plus, you don't need to use as much as you do with the thin, cheaper brands. Pleased with it, and will re-purchase. Been using Charmin for years and would not change ever. It is soft, and the quality is excellent and so is the pricing. So nice to see a company that puts quality 1st and thinks of the customer. I purchased this product based on other buyers reviews and I was not disappointed. I like the fact that the rolls are large, and you will use less of this product that others on the market. Plus no lint! Will definitely re-buy. Greatest tp available. Beats all the competitors by a wide margin. Soft and strong. very cushy. This is my family's favorite. I don't buy anything else. This is the only tp I like to use. Doesn't leave anything behind. 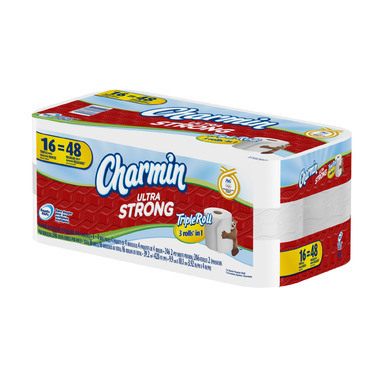 Best product on the market are the Charmin products. Strong but it does not plug toilet. Soft and the quality is tops. When it's not available on this Island I order from the great Well.ca Co. and have it shipped out here. Not that I've tried every single toilet paper there is, but this one has what I want the most: no tearing, no pilling. That's right: pilling; little rolled up balls of TP left behind. No tearing allows you to use less. Buying the cheapest is a false economy because you use it all up trying to do the job! Product is excellent. Great quality. I am never disappointed with Charmin products. Wonderful to see a another company who puts the Customer satisfaction 1st just like well.ca does. Great product- soft and strong. So worth the price! I use so much less at each bathroom visit, and it stands up to the challenge! Always look for this brand when it is on sale. I try and keep a supply handy, as it is a favourite of mine. Great combination of strong and soft. Only tissue that is that good. Definitely worth stocking up on. Thanks, Well.ca for selling the basics! Shipped fast and paper is soft and strong. Would definately buy again. Strong. Reliable. Excellent brand! And great pricing too. Good. It doesn't fall apart.